Whenever someone comes into a boxing gym they always want to learn fantastic, advanced boxing combinations. It is the first thing they think of when mastering the sweet science of boxing. Sure, there definitely are some devastating combinations that you’ll see in some of the bigger fights, but usually more often than not, they are no more than two or three punches. So much more goes into setting up that perfect combination and making it effective. Balance, footwork, movement, speed and range all play a key role in any great boxing combination. Let’s take a look at some classic boxing combinations. The basic one-two combines the jab and the straight-right punch. First, practice with shoulders only—while keeping your hands limp and arms completely relaxed. Coordinate your upper body movements with your step/drag as you move forward and back. When you get that down, add the arm movements (punches). Start slowly, breaking this combination down into its separate parts. Your left hand and foot work together, as you step you also jab. Your right hand works and foot work together as you drag the back foot forward. The left and right hand pass one another in this combination. As one hand returns to the face, the other is just moving forward. Here is where this simple combination gets tricky. As you bring your left hand back to your face (dragging the ball of your right foot), rotate your right shoulder and hip forward and throw out your right hand, while you drag your back foot forward and twist at the core. Synchronize your movements. Bring your right hand back to hands-up position by twisting your shoulder and hips back into basic stance. Breathe—and remember to exhale each time you throw a punch. Focus points: Remember to move your arms as extensions of your shoulders. Keep your knees slightly bent, 2/3 of your weight on your back foot. Bring your arms out fast and bring them right back in to protect your face. The twisting of the core is what brings your arms and hands back into position. Keep your wrists bent slightly forward and rotate them: fists should land palm-down when punching. Throw the one-two with your shoulders while keeping your hands down, but as you bring your right shoulder back into position you will throw the left shoulder forward with your core. Rotate your left shoulder, hip, knee, and foot as you forcefully twist your trunk until your left shoulder and hip face 12 o’clock. Right shoulder and hip is thrust behind you, in turn, twisting your back foot to 3 o’clock position. At the same time, move your right shoulder to 6 o’clock, as you pivoton the ball of your left foot, keeping your heel just slightly off the ground, allowing the foot to pivot to 3 o’clock. Keep your shoulders and hips in line with each other and contract your abdominals. After the one-tow lands and you are bringing back your right hand rotate your body to the right, bring your left forearm out in front of you, turned down to the right. Bend your left elbow at a 90-degree angle (L-shape), keeping your forearm horizontal to the ground. Turn your knuckles down slightly on impact to avoid wrist injury. Do not allow your punch to get too close to your face or your elbow to pass your left ear in the mirror. After impact, allow the twisting of your trunk to return your hand back into position while twisting your feet and body back in to your basic stance. Imagine a string ties your wrist and knee together. Everything moves simultaneously. Add speed as you find your rhythm. Avoid swinging your right arm back as you throw your left hook. Avoid overextending your arm—beyond a 90-degree angle. Bend your wrist slightly—just before impact. Keep your weight evenly distributed on both feet. Bring your elbow up as you throw your hook, but make sure you can see over your forearm. Start your slip with a forceful twist at the waist to the left, encompassing that whole side of the body. Stay balanced in your stance. Center of movement is at your hips. Move the right hip along with your right shoulder and knee, as the ball of right foot twists in the same direction. Your right shoulder moves to 1 o’clock and left shoulder to 7 o’clock, with your right forearm vertical in front of body. Your fist covers your opponent’s nose, while the back of your hand faces outward. Twisting your body moves your head out of the way of the punch. Now as you twist right back into position you will unleash the left body shot. As you are twisting back into position from the slip, thrust your left arm in a swooping motion while rotating forward with your left shoulder, hip, knee, and foot. Keep your knees deeply bent, with your head at your opponent’s chest level. Your target is your opponent’s lower body. Allow the momentum of your body to throw your arm out from your shoulder. Your punch impacts at waist height. Maintain a slight bend in the wrist; in a scooping motion, throw your body shot with your palms facing up and impact the bag with first 2 knuckles (of your index and middle fingers). Now you will start to twist your core back lightly to the left while bringing your hand back to your face and then this is when you throw the left uppercut. As you drop down a bit, lean your upper body forward slightly. Then push up with your legs, swinging the left side of your body upward in a swooping motion, your left shoulder rotates the left arm out and upward. Punch upward with your left fist, keeping your palm facing you, with a slight bend in the wrist. Keep your pressure on your back foot for leverage and power. Keep your opposite arm up, protecting your face. Finish with your left shoulder at 12 o’clock. Pull your hand and arm right back into position. From boxer’s stance, bend your knees slightly, dipping about 3 to 4 inches, as you lean slightly forward with your upper body. Push upward forcefully, engaging both legs. Rotate on the ball of the right foot, but do not move the front foot. There is a slighting swooping motion with your body as your hips and shoulders rotate to the lesft. Be sure you really twist your back foot and bring your right shoulder to 11 o’clock. Bring your right fist up and outward as you rise. Avoid standing straight up as you throw your punch. Keep your left hand close to your face until you push up with your legs. After the uppercut lands and you are bringing back your right hand rotate your body to the right, bring your left forearm out in front of you, turned down to the right. Developing boxer’s rhythm takes work. It’s an acquired skill that’s more than just the movement involved. It comes from within—like your heartbeat. Boxer’s rhythm expresses your heightened awareness and readiness to move in any direction—instantly. At the same time, it involves your ability to stay limber and relaxed, breathing deeply. Pay attention to maintaining proper stance and balance while you’re in motion. Anticipate action and reaction—your own and those of your opponent. Always keep a slight bounce, without allowing your feet to leave the ground—that’s the key to acquiring this fundamental boxer’s skill: always in motion. 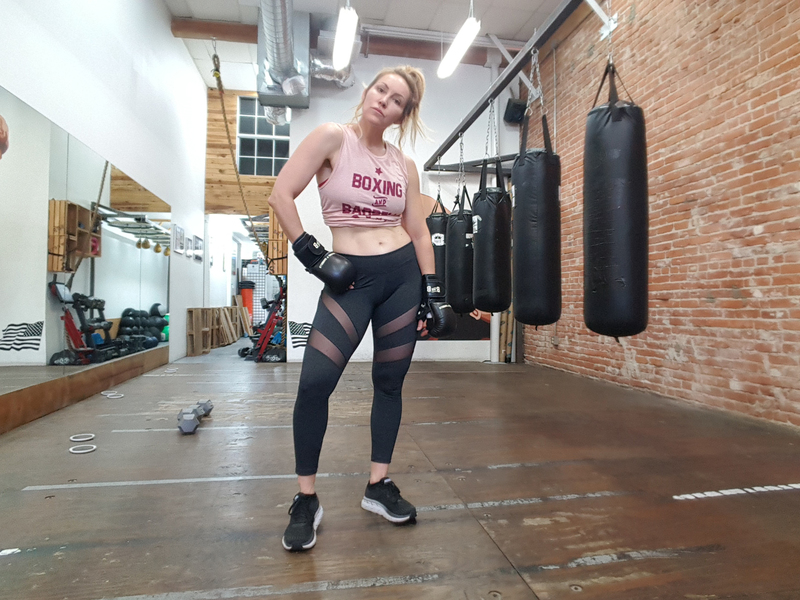 Boxer’s rhythm is a work in progress—as your mental awareness and physical conditioning improve—so does your ability to tap into this inner energy. You see, it isn’t necessarily the more advanced combinations that will make you a master of the ring; it is honing the skills necessary to throw those classic combinations. Once you have balance, great footwork, movement, speed and range, the hands will follow.